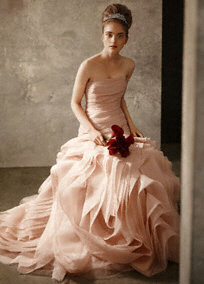 What is a Couture Bridal Gown Cleaner? Couture is a French word for "designing, making, and selling highly fashionable clothing, usually employing fine fabrics and exemplary construction and sewing techniques." Sophisticated tailoring, fine or delicate fabrics, intricate beading, appliques, embroidery, or other fragile handwork are common traits of fine couture by designers such as: Alexander McQueen, Carolina Herrera, Celine, Chanel, Christian Dior, Deborah Johnson, Dolce & Gabbana, Donna Karan, Eleny Couture, Escada, Fendi, Givenchy, Gucci, Hermes, Holland & Holland, Hugo Boss, Issey Miyake, Jil Sander, Language Boutique, Linda Dresner, Louis Vuitton, Holly Harp, Maggie Norris, Miu Miu, Narciso Rodriguez, Norma Kamali, Pilar Rossi, Prada, Ralph Lauren, Roberto Cavalli, Randi Rahm, Valentino, Vanessa Fox, Versace, Vera Wang, Yves St. Laurent, Kevin Hall, and others. Some assume that couture designs are extraordinarily expensive, and they often are, but it's the design nuances, sewing techniques and fabrics that define couture. These same features and qualities largely determine the care that couture creations require. As a Certified Garment Care Professional, Iris City Cleaners posses the Professional Certification (a select few of 33 Nationwide), to manage the requirements of Couture. Iris City Cleaners, with its Museum Care Preservation Technology, manages Couture requirements on a daily basis. Couture care is a delicate process, involving sophisticated technology, chemistry and years of practical experience. A couture care specialist is a well-trained master of their craft, from couture apparel to your white cotton shirts. We clean and restore all clothing, from casual to couture, as well as bridal, vintage, heirloom and museum-quality textiles. Whether you have a high end suit, sweater or blouse that you wear regularly or a vintage family garment handed down from your parents or grandparents, we will apply hand cleaning and finishing techniques so your couture garments are certain of receiving the correct and proper professional care you want them to receive. Your items are cleaned by themselves and carefully steamed and pressed, then inspected, and expertly packaged before returning to you. While this treatment requires more time, the quality of our couture cleaning techniques are well worth the wait. Couture cleaning is not for everyone, but if you have high-end designer garments or want only the best personal treatment for your wardrobe, trust them only to couture trained cleaner. This pricing, while higher than our regular pricing, reflects the time, care, and process we use to insure the outcomes both the customer and Iris City Cleaners expect.